The West Elk Blades U19 girls hockey team, now called the Wolverines, enters the 2016-2017 season depleted but nonetheless confident. 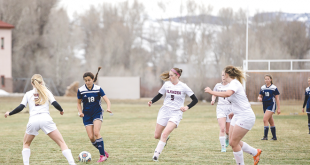 The Wolverines finished last year’s regular season in second place and then battled their way through the state tournament winning three games in a row before falling in the finals to league rival Colorado Springs 3-2. Unfortunately, as is the case with any program with a smaller pool of players, numbers fluctuate and this season the Wolverines are entering a down year. Due to graduation and injuries, the Wolverines are down to nine skaters this season. Furthermore, illness has run rampant through the team during pre-season workouts, leaving the team even more depleted as they prepare for the upcoming season. Due to their low numbers, the coaching staff has been running players in a variety of positions getting them used to what may become the new normal for the Wolverines. “We told the girls they may have to jump in anywhere and play a number of different positions,” says Santelli. While the team lost head coach Tony Lambert to help coach the Bantam boys, Santelli slid right into the head coaching position and has been with the program through all of the good times and bad. In addition, assistant coach and skills specialist Katie Brawner returns and former Blades player Molly Cannon is jumping on board as well. The Wolverines will also have the benefit of returning goalie Anika Anderson who stood out above the rest last year as a freshman. “It’s always good to have a good goaltender,” says Santelli. The team is led by three seniors this year—Hailey Shreeves, Izzie Dethloff and Kendl Santelli—and the coaching staff looks to maintain the Wolverines’ style of play, with some tweaks due to their low numbers. As for goals for the team, it’s still a little early to tell. One thing is for sure: The Wolverines will be playing all season in the cross-hairs of their opponents. The Wolverines open league play this weekend as they head to the Front Range to take on Colorado Select. 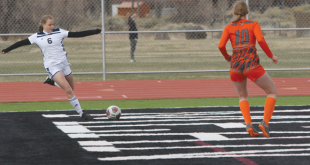 They take a break from play for the following week and then host their first home games of the season when they play Steamboat Saturday and Sunday, December 17-18.